I only know his name is Robert, a natural craftsman. A friend of mine introduced him to me one summer afternoon. 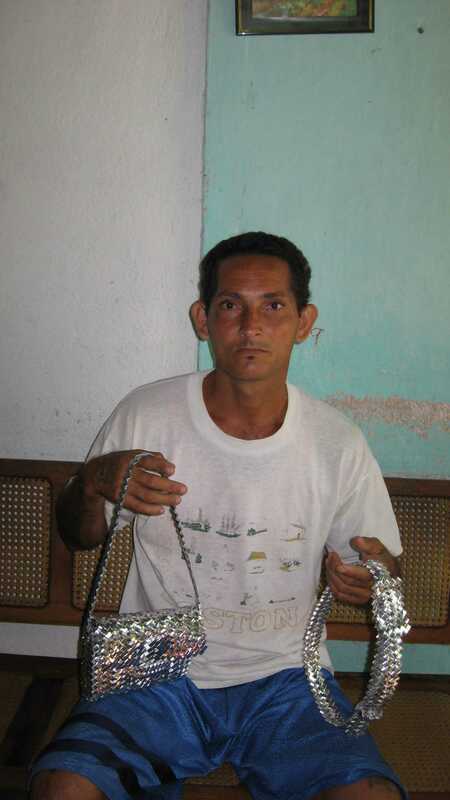 He makes useful objects, like belts, purses, bags, and key chains from empty packets of the Piñata soft drinks sold in Cuba. He learned to do this from prisoners, who are very creative. He did not speak throughout the entire afternoon, “I am behind on some orders, buddy,” he said and continued tearing strips of metallic paper. Robert’s work brought smiles to the more humble mothers a few days ago when they received their gifts. He earned a few pesos to feed his own and buy his own mother something, because in any case, tenderness is the last quality to be lost. He is now racking his brain to invent something so in June fathers will have their own joy. His task is difficult because in addition to knowing men don’t care for knick-knacks, he also has to contend with hellish police surveillance. He has already seen an elderly man be fined 300 pesos and have his two strands of garlic confiscated, a woman having to go to court for selling plastic bags that in other parts of the world are used for carrying one’s purchases. He knew about the checkpoints when exiting any town, about police on the road–which connects his small inland town to the seaside– who ask to see one’s national identity card and he is afraid the same could happen to him. On May 6th I walked into Antonio Maceo Square in Santiago de Cuba. I had been invited to cover the 5th meeting of the Board of Directors of the Eastern Democratic Alliance. A group of government opponents, we were caught in a sting operation led by Major Diorkis of the Cuban political police, Department 21, to prevent us from gathering in one of the most sacred bastions of the Cuban high command. Those of us who saw what was happening regrouped in the center of the market and walked towards the University of Oriente–there we yelled “Long Live Zapata” three times. It was a cry for freedom in Cuba. We quickly climbed to the top of Quintero Hill, adjacent to the university headquarters. We walked across “El Hoyo” neighborhood where we visited with the residents and then retreated to a secluded place for the Board of Directors’ meeting. 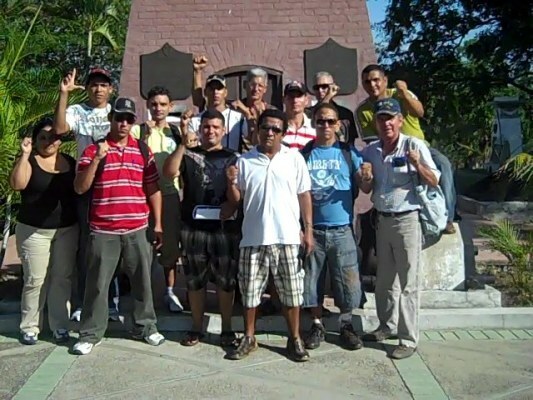 Among the dozens of activists were members of the Liberal Cuban Party, MC Youth for Democracy, FLAMUR, Political Prisoners “Pedro Luis Boitel,” People’s Party (Progressive Branch), and others within the Eastern Democratic Alliance. Alliance meetings are typically held publicly, and this time, as part of its analysis of the problems and issues raised by the Board of Directors, the Board expressed its support for the Damas de Blanco, Guillermo Fariñas, and Reina Luis Tamayo Danger, Orlando Zapata’s mother. Fifteen activists were detained and released hours later that day, except for Rolando Rodrigues Lobaina, who was detained until the next day. The situation at the Square, young men taken away in patrol cars and the persecution to which we were subjected afterwards, reminded me of what I have read regarding the underground struggle in this eastern city against Fulgencio Batista. The same story retold, but with different actors, in special circumstances.